Located in the iconic Marine Court on St. Leonards seafront, we're easy to reach from both Hastings and Bexhill. The core of our business is a fully equiped bicycle workshop. Our bicycle service is high quality at a fair price. We can build wheels, get frames painted and enjoy custom builds. 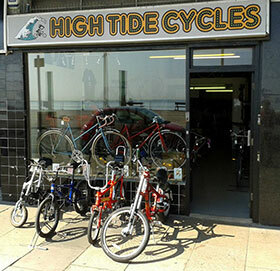 We sell fully serviced used bicycles and hold a wide range of bicycle components and accessories. We aim for functional, durable and reliable products at a reasonable cost. We're opposite the National Cycle Route 2, come and find us.